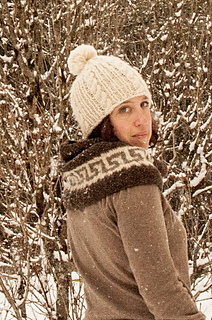 Last year I took a colorwork knitting class with Canadian designer Sylvia Olsen, author of Knitting Stories: Personal Essays and Seven Coast Salish-inspired Knitting Patterns and Working with Wool: A Coast Salish Legacy and the Cowichan Sweater. 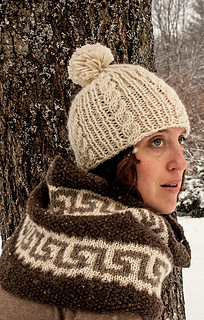 I learned that this style of knitting is the only 100% North American knitting tradition. 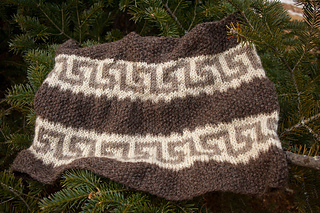 I designed this cowl because I had so much fun in the class, I wanted to keep knitting more Coast Salish-inspired patterns. 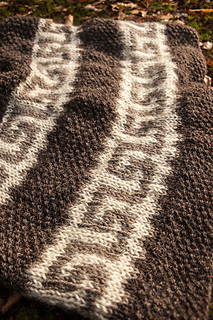 This design is dedicated to Sylvia and to all of the Coast-Salish knitters who have knit in this style and who have designed and knit the famous Cowichan sweaters that are still inspiring knitters everywhere today. Ross Farms works hard to make you amazing wool products from their flock of Heritage and Rare Sheep. Learn more about this wonderful Pennsylvania farm on their website. 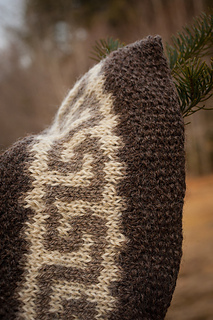 Yarns are for sale in their Etsy store and at various sheep and wool festivals throughout the year.